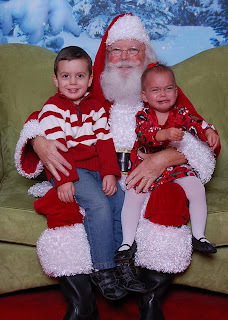 Why do I ever think Santa pictures are going to go off without a hitch? With all the fuss and the chaos, all I want to do is grab my knitting needles...whether to knit or to stick in my ears is entirely up in the air. Today, two of my girlfriends and I decided to take our children (totaling 6) to the mall to get Santa pictures. This is year three of our tradition and each year we actually look forward to the insanity of long lines, screaming kids and grumpy "elves". This year there was a bonus: we could buy a USB with the photos on them to make our own copies instead of paying the outrageous price for 1 5x7. Anyway, my son, who's 3 1/2, is past his freak-out-over-Santa phase (whew!) but my daughter, 15 months, is just entering it. I love the picture because it captures both of them in there natural states - happy-go-lucky and tantrum-central. Next up, we had th e three older children sit all together with Santa. It's a wonder that we even were able to get a picture with all three of them looking at the camera and smiling at the same time. Check the sky for UFOs and all sorts of other paranormal activity. The last batch, however, was the most classic. Three little ones on Santa's lap and poor Santa trying to maintain his joyful smile! My friend's 11 month old son weighs more than my daughter (who's 4 months older) and Taylor refused to let go of her Ritz. Meanwhile, my other friend's daughter (9 months) is taking it all in and wondering what the fuss is...she's found the most comfy pillow in the world! I feel for Santa, I really do. Who else has to grin and bear screaming kid after screaming kid. (Hmmm, should I look in the mirror?) That's why I know Santa must knit. There's no other thing in the world more relaxing (except maybe a foot massage). I can just see him up there at the North Pole. Elves scurrying about, Mrs. Claus mending his suspenders, Santa, knitting yet another pair of red, green and white striped socks. So, I've got a plan that's sure to work. I'll buy Santa a new pair of needles to go with his cookies and milk this year. Maybe, if I'm lucky, I'll find some in my stocking too! What other knitting gadgets are great stocking stuffers? What's on your wish list? Make your mark below and be sure to send hubby the link!